From the early 1960s to the early 1970s Strathmore’s promotional mailings reflected the parallel trends of the “Push Pin Style” and Swiss modernism. While the designs by Milton Glaser, John Alcorn and Simms Taback represented a renewed interest in making paper a physical part of the picture, promotions by Richard Danne (b. 1934) and Ken Kuenster (b. 1931) marked a return to the company’s 1920s emphasis on the interaction of colored inks and colored papers. In Kuenster’s designs Swiss modernism collided with psychedelia. the gestalt assault opening spread (Strathmore Paper Co., 1970). Design by Ken Kuenster. Photograph by Ariel Smullen. 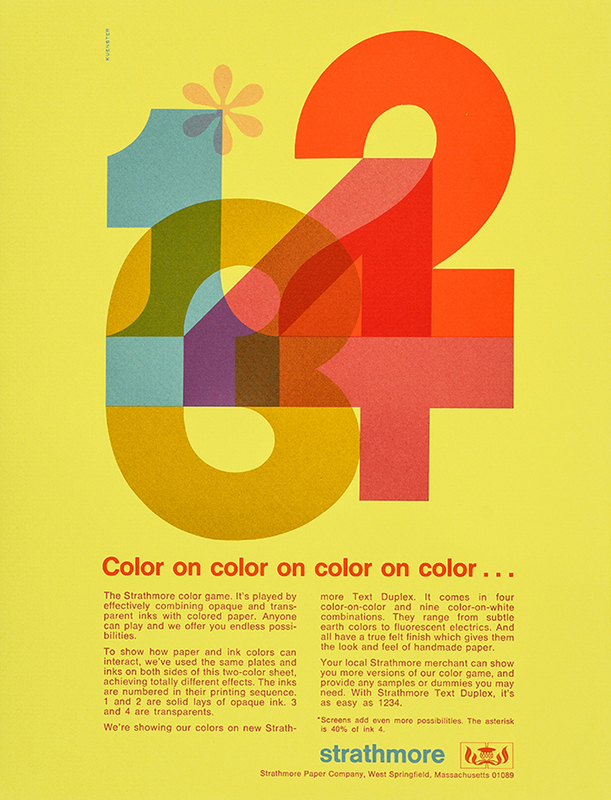 Kuenster designed two promotional mailers*, the gestalt assault and Color on color on color on color… , which upended Munsell’s color investigations by showcasing “unharmonious” color combinations and fluorescent colored papers. 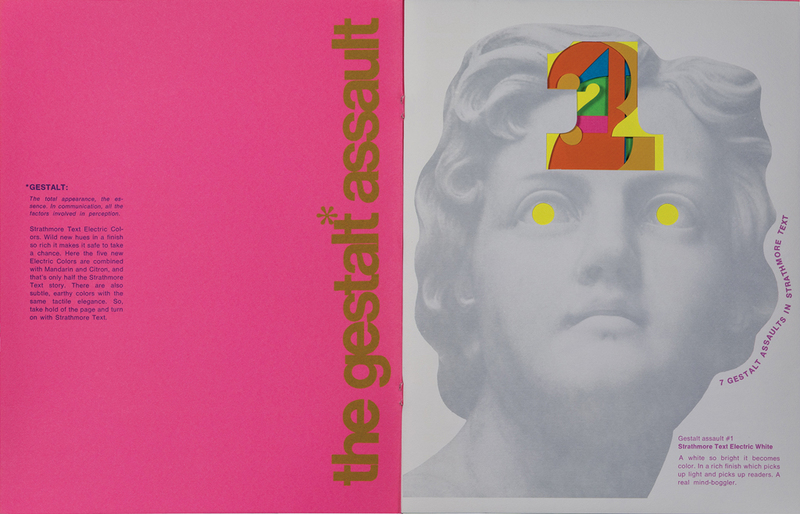 the gestalt assault introduced Strathmore Text Electric Colors (Electric White, Electric Yellow, Electric Pink, Electric Blue, and Electric Green), five “wild new hues in a finish so rich it makes it safe to take a chance.” (Unfortunately, the eye-popping fluorescent colors have faded with exposure to light since the Strathmore Archive was uncovered.) Using the lingo of the day, Strathmore urged its customers to “turn on” with the new papers. 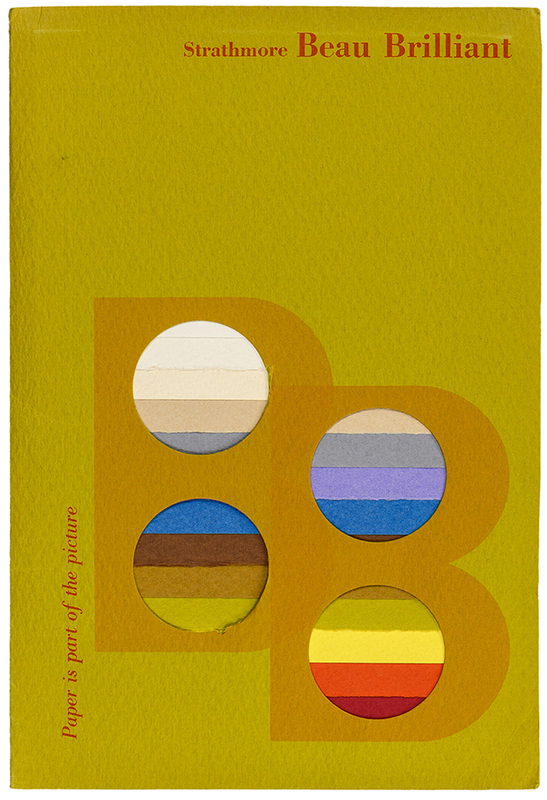 Using a tunneling set of die-cut numbers Kuenster layered the seven colors—the five new electric colors plus the existing colors Mandarin and Citron—in the mailer. The concept was reminiscent of Will Burtin’s Expressive Printing Papers portfolio of 1953, but the effect was totally 60s. The disparate imagery, which ranged from children’s drawings to photographs of Brutalist architecture, was also of the time. 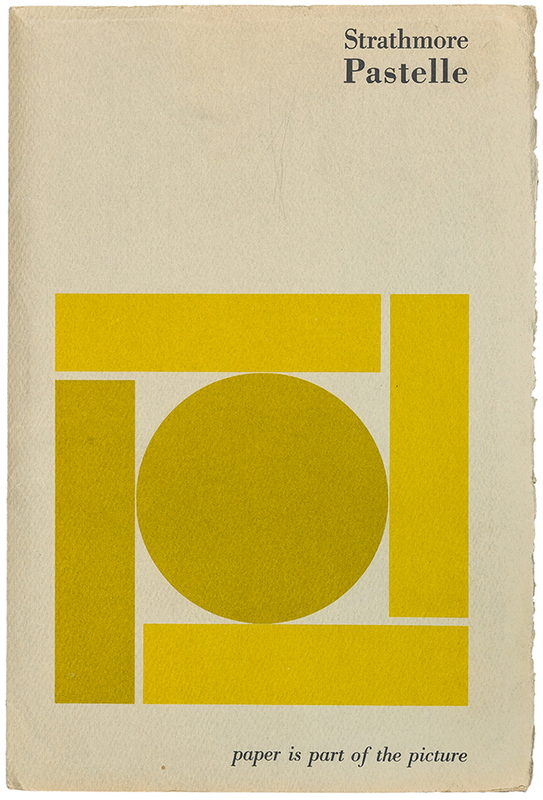 Spread from the gestalt assault mailer (Strathmore Paper Co., 1970). Design by Ken Kuenster. Photograph by Ariel Smullens. 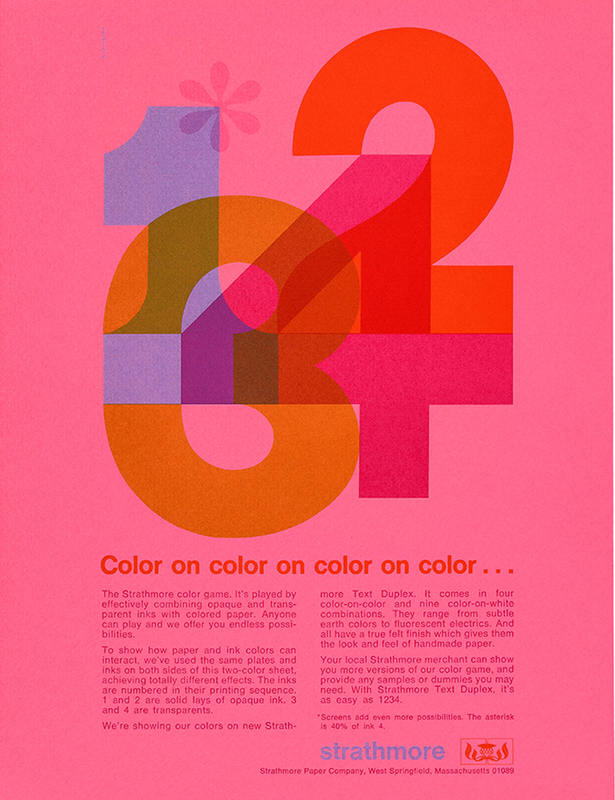 Sheet from Color on color on color on color… promotion (Strathmore Paper Co., 1971). Design by Ken Kuenster. Photograph by Vincent Giordano. Kuenster’s designs for Strathmore referenced several art and design trends of the 1960s. 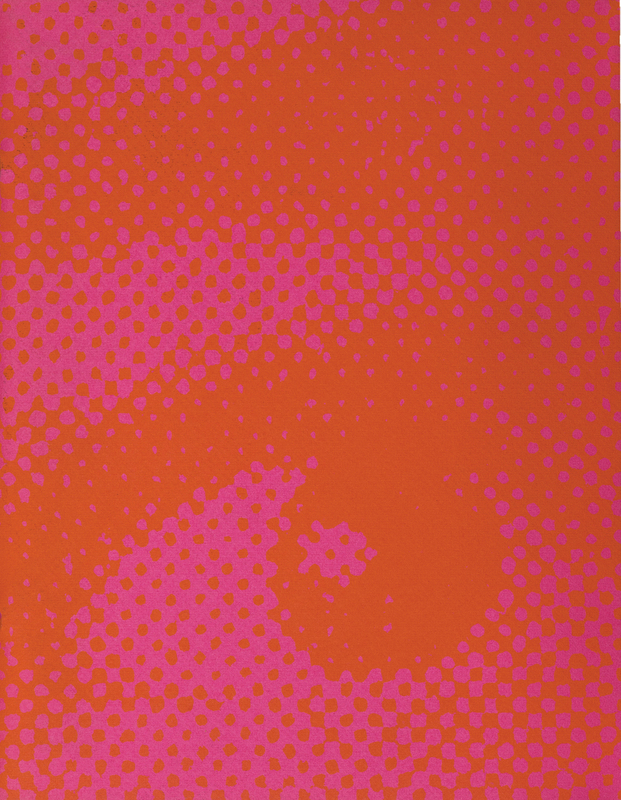 The cover, with its enlarged halftone dots, was both a nod to Roy Liechtenstein’s comics-influenced paintings and to Op-Art. The electric colors, of course, were clearly derived from the psychedelic rock posters of Victor Moscoso (b. 1936), Wes Wilson (b. 1937), and others designed for the Avalon Ballroom and Bill Graham’s Fillmore Auditorium in San Francisco. In contrast, the typography was influenced by Swiss design. 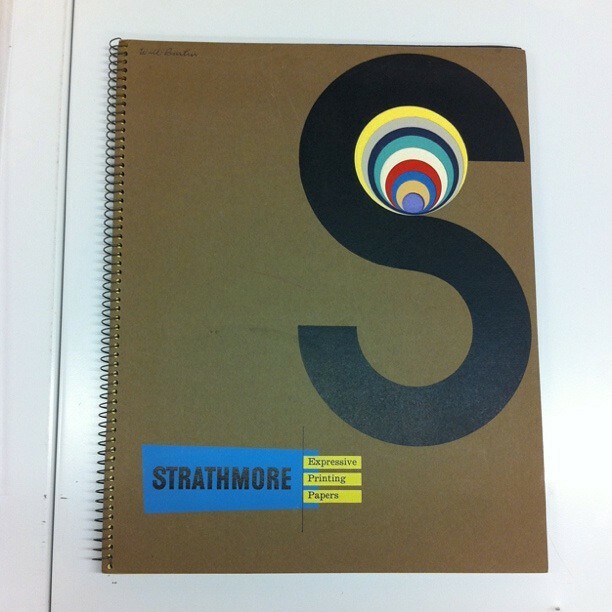 The text was set in Helvetica—as was a new Strathmore logo. 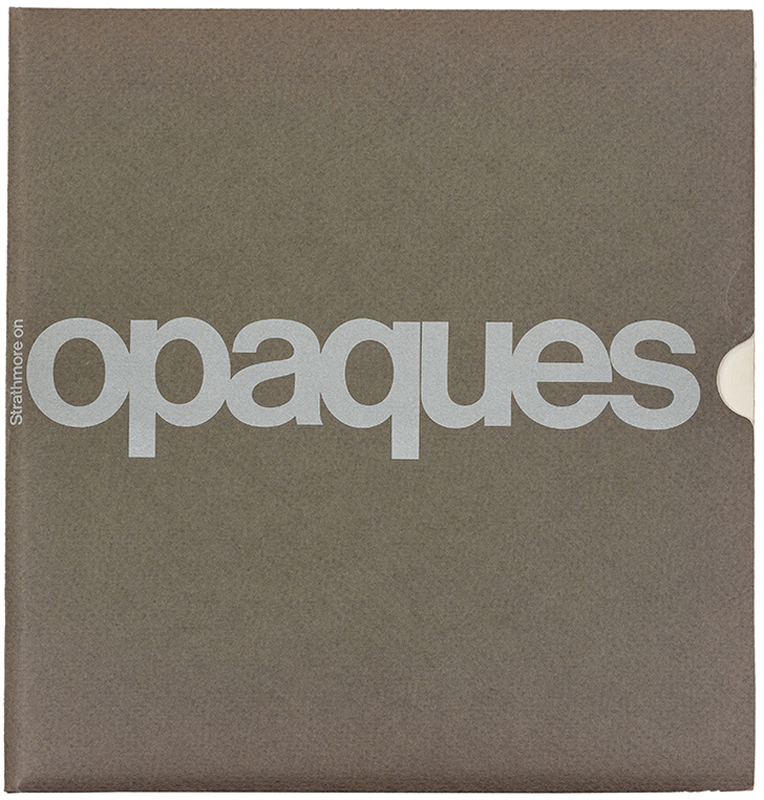 Cover of Strathmore on Opaques mailer (Strathmore Paper Co., 1970). Design by Richard Danne. Photograph by Vincent Giordano. Strathmore on Opaques, designed by Richard Danne, was the final piece of Strathmore’s early 1970s color trilogy. The portfolio, which consisted of nineteen sheets, demonstrated how opaque inks could work with Strathmore’s colored papers. Although less elaborate, it was in effect, an updated version of A Grammar of Color (1921) for the Pop and psychedelic era. The sheets, with their array of colored circles, inevitably suggest Jasper Johns’ “Target Paintings” as well as Josef Albers’ Homage to the Square series of paintings, both of which were very influential at the time. Sheet from Strathmore on Opaques mailer (Strathmore Paper Co., 1970). Design by Richard Danne. Photograph by Vincent Giordano. Sheet from Strathmore on Opaques mailer (Strathmore Paper Co., 1970). Design by Richard Danne. Photograph by Ariel Smullen. 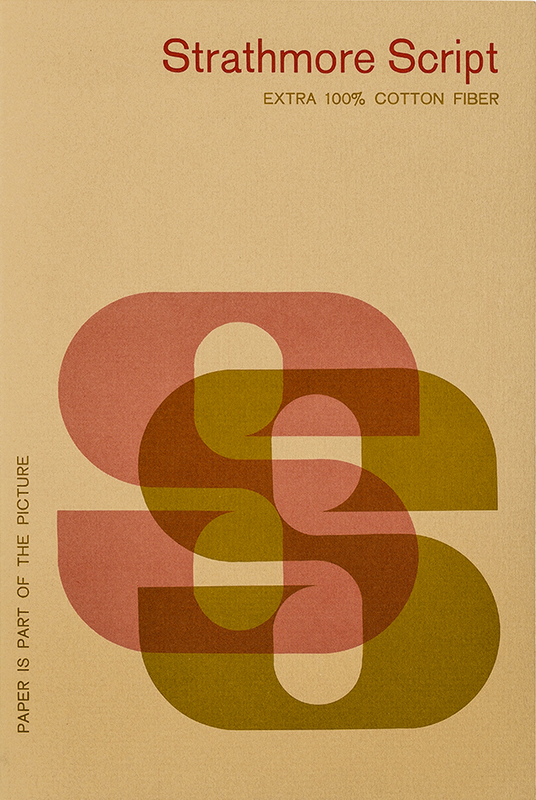 Cover of Strathmore Brilliant swatch book (1969). Designer unknown. Photograph by Vincent Giordano. Strathmore Script swatch book (n.d.). Designer unknown. Photograph by Vincent Giordano. 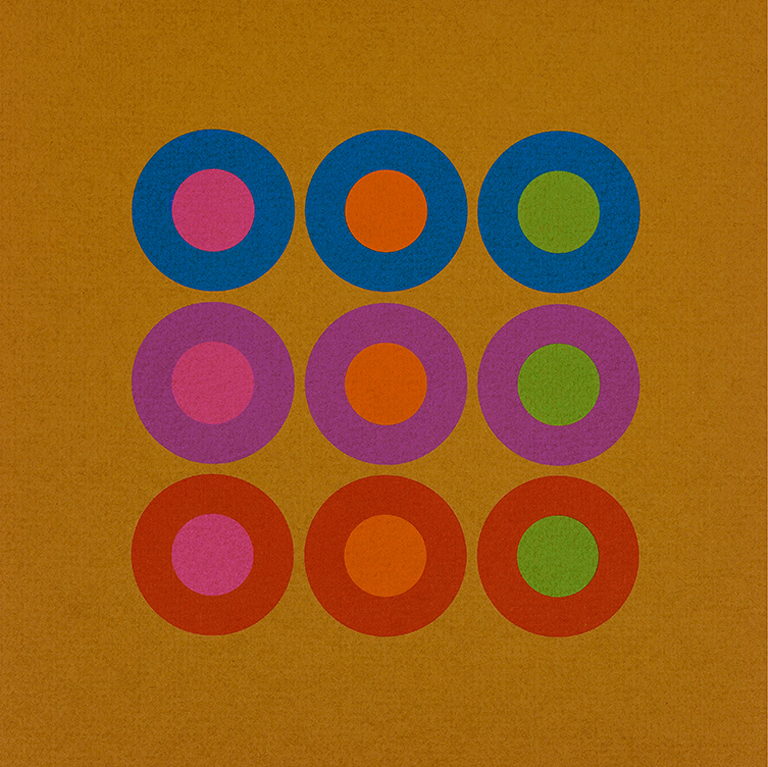 Cover of Strathmore Pastelle swatch book (1968). Designer unknown. Photograph by Vincent Giordano. 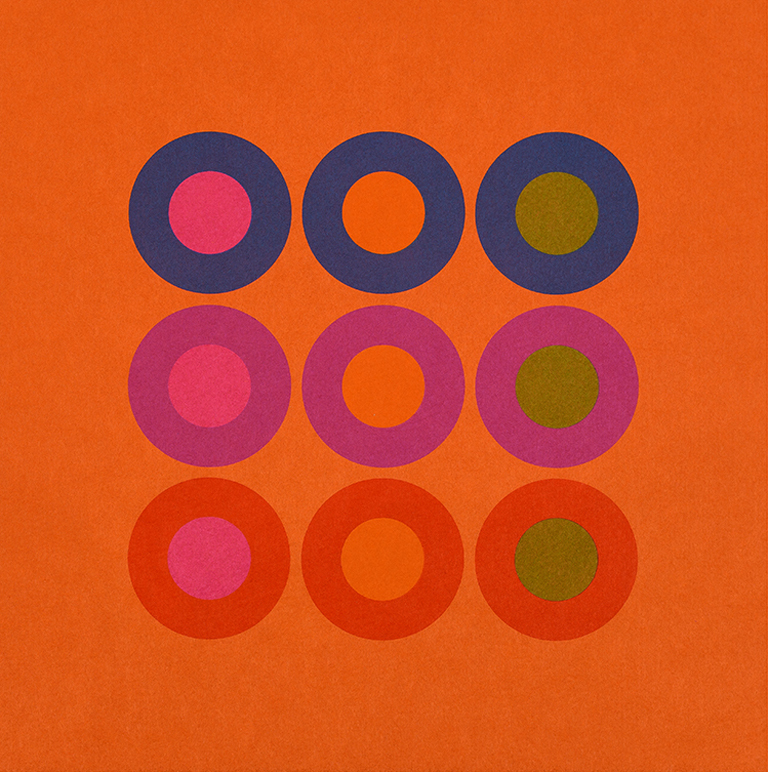 Cover of Strathmore Cover and Strathmore Cover Duplex swatch book (c.1969). Designer unknown. Photograph by Vincent Giordano. The identity of the designer of these swatch books is unknown, but they could be the work of Kuenster. The color play and interest in letters for their formal quality suggests as much. Certainly, he designed the joint promotion for Strathmore Fairfield and Strathmore Impress, entitled hi fi, that has elements similar to the swatch book for Strathmore Impress. 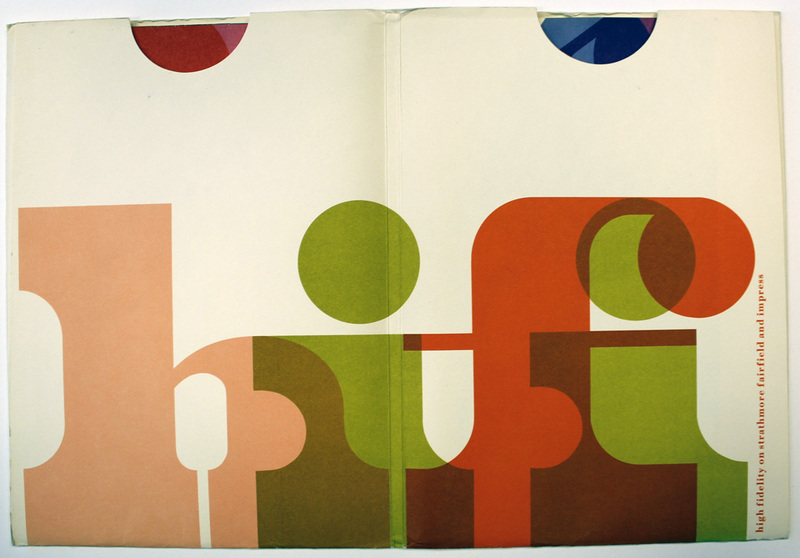 Spread from hi fi mailer (c.1971). Design by Ken Kuenster. Photograph by Ariel Smullen. 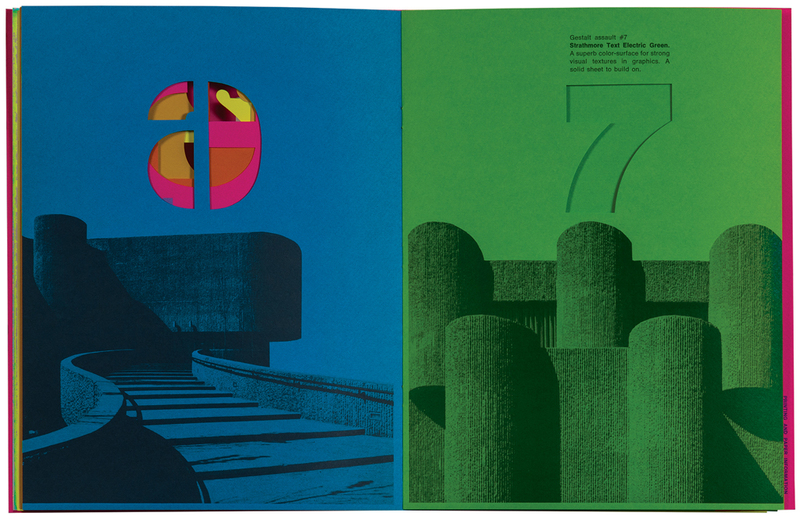 *Kuenster also designed See Spot Run (1970), a promotional piece that is not in the Strathmore Archives at Mohawk and which I have never seen. Not all American modernism in the 1960s was of the Swiss variety. There was an older homegrown strain, typified by the work of Paul Rand and Alvin Lustig, that was looser and more playful. George Tscherny (b. 1924), whose work oscillated between the two camps, designed several items for Strathmore in the 1960s that reflected both approaches. 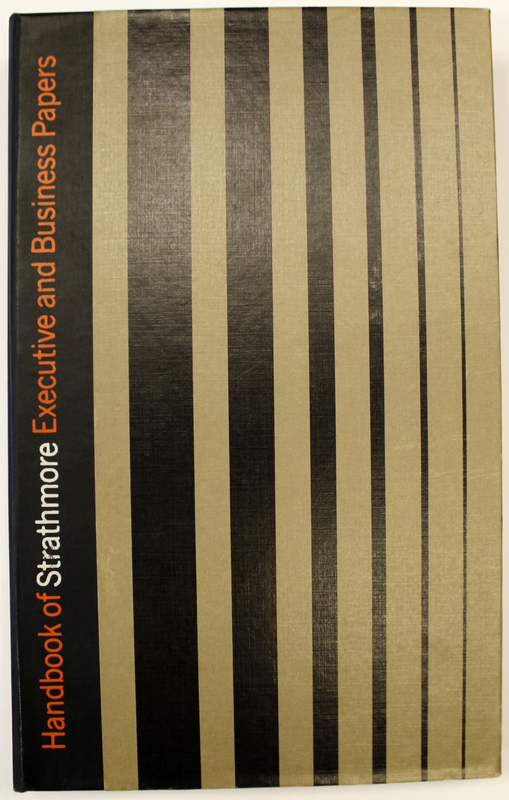 He used the austere Swiss typographic style for a Handbook of Strathmore Executive and Business Papers in 1965. 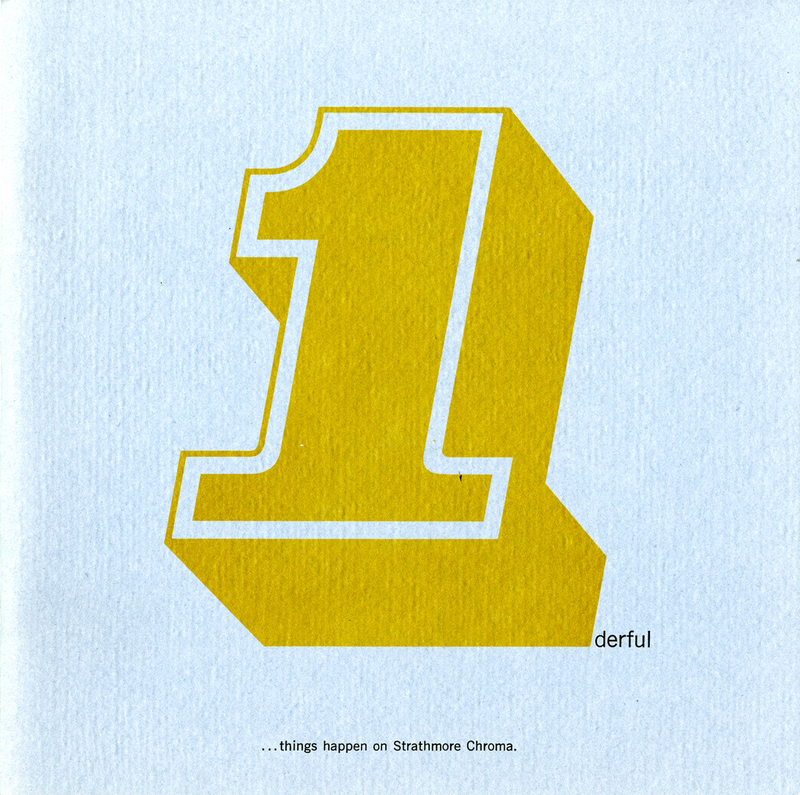 In contrast, his design for a promotion for Strathmore Chroma, entitled 1derful, is as amusing and enjoyable as anything from the Push Pin artists. The design of Tscherny’s Strathmore Chroma promotion is predicated on wordplay with the cover and each of its spreads mixing numbers with similarly sounding words or syllables (e.g. “one” and “won;” and “ba[sics]” and “six”) to enumerate the paper’s qualities. Thus, Strathmore Chroma is “3fty” (“for those tight-as-a-burr single impression budget jobs and getting a rich two-color effect at a one-color price”). 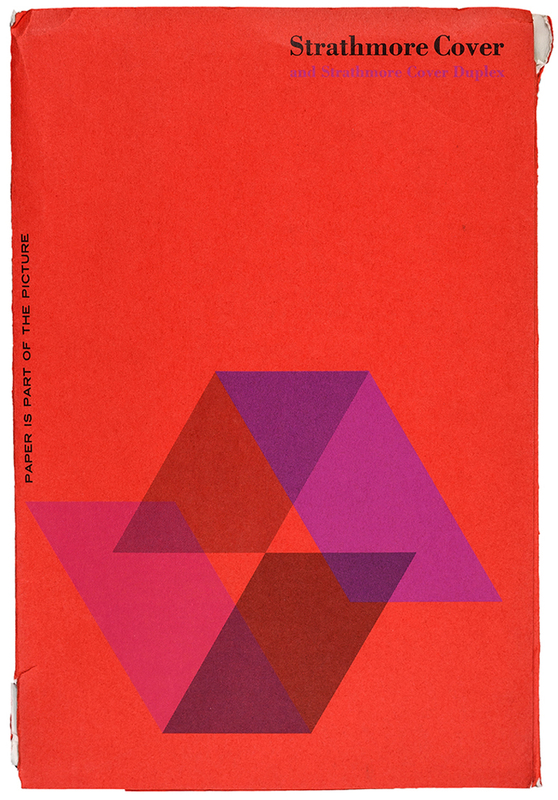 Cover of Handbook of Strathmore Executive and Business Papers (Strathmore Paper Co., 1965). Design by George Tscherny. Photograph by Ariel Smullen. 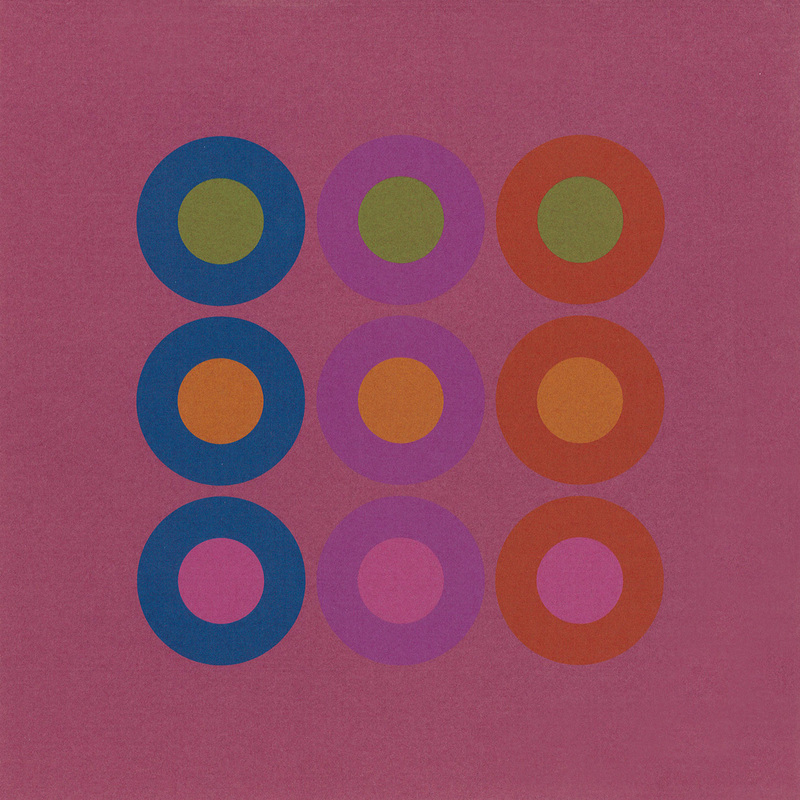 Cover of 1derful promotion for Strathmore Chroma (Strathmore Paper Co., 1966). Design by George Tscherny. Image courtesy of the Milton Glaser Design Study Center and Archives, School of Visual Arts.